Downtown Decorah. Yes, there is a stoplight. We continued our tour of cousins and drove from Des Moines to Decorah—after a stop in Bondurant to find Auntie J’s old home place, then north on I-35 and then across the state to the northeast corner in driving rain. 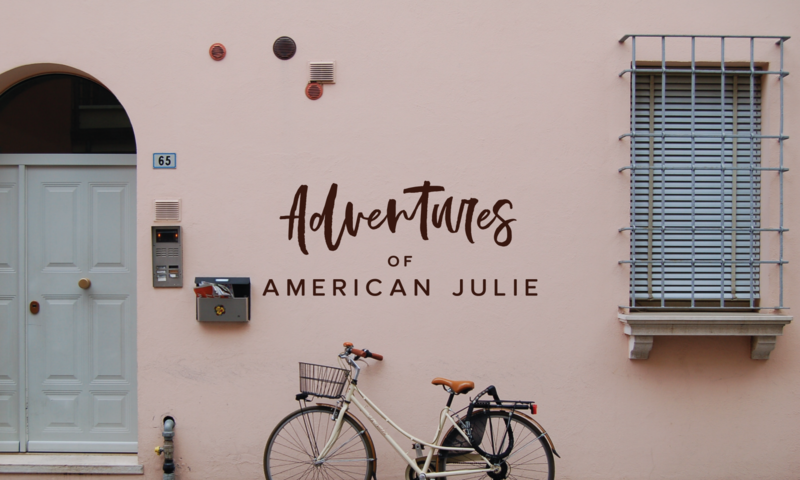 We arrived later than we expected and a little emotionally wrung out from navigating in the rain and on unfamiliar roads. We checked into the historic hotel right on main street and then met our cousins and their friends for happy hour. We had a very happy hour trying locally brewed beer and sharing stories with cousins Terri and Chuck and their friends Darrel and Betty. We then got the windshield tour of Decorah including Luther College, where many of the buildings were designed by Uncle Jack Thompson (now deceased). We went for another big meal at McCaffrey’s Dolce Vita restaurant. Jeanette and I were beginning to feel like pigs being fattened for bacon and chops. I am going to have to figure out how to navigate the caloric landmines before I visit again. 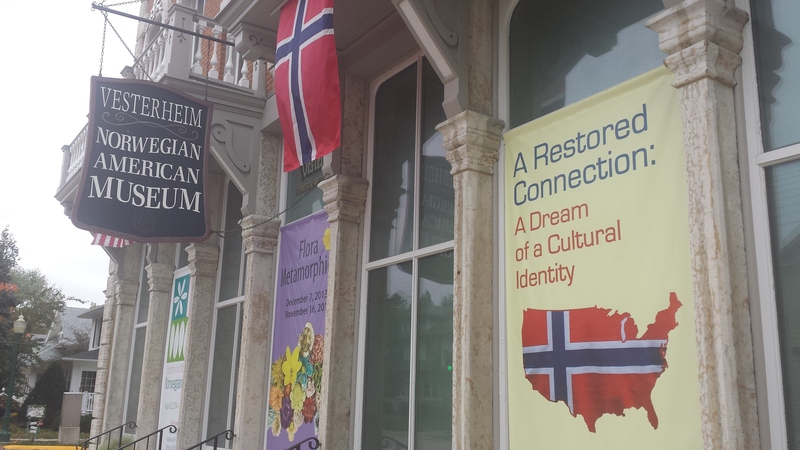 Decorah takes great pride in their Nordic heritage. The high school mascot is the Vikings and the highlight on the summer calendar is Nordic Days. My cousins Terri and Chuck have a gem of a gift shop specializing in Norwegian gifts called Vanberia. The next morning we met Terri and Chuck for breakfast (more bacon) at the hotel restaurant, Restauration, a spin off the name of the boat that brought the first Norwegian immigrants to America. Jeanette joined them for a quick trip to the cemetery to honor loved ones and I stayed behind to handle some memos and other work. We met up and went shopping. Jeanette found a dress shop she really liked and I found the Blue Heron Knittery. We each made additional contributions to the local economy. A wonderful gem of a museum on the Norwegian immigration experience. We said our goodbyes and then checked out the Norwegian-American museum. Vesterheim is an excellent small museum that focuses on the story of the Norwegian emigration to the USA. 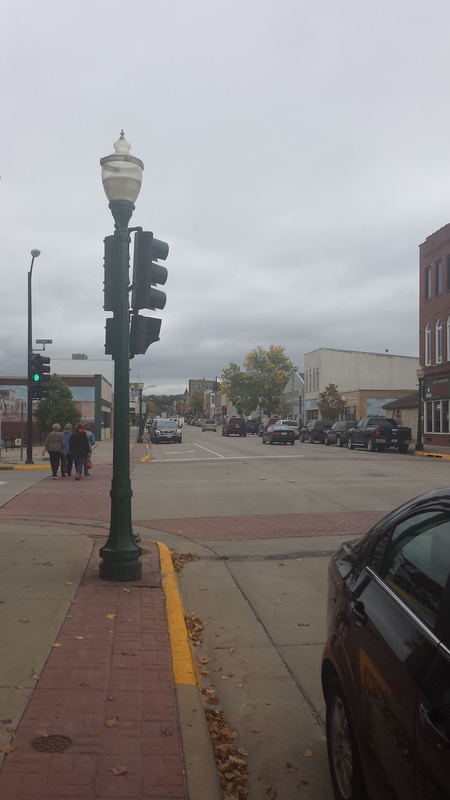 I also took a photo of main street (at top of post) as we got ready to leave town because it was heartwarming to see an intact small town not ravaged by edge of town Walmarts or strip malls. 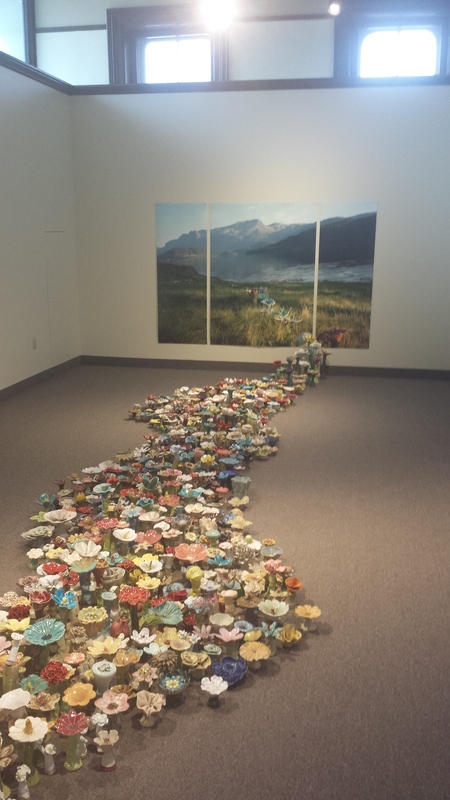 Beautiful ceramic flowers made by artists in Bergen make up the special exhibit on the main floor. A real whirlwind trip, we then drove back to Des Moines and on to Stuart.